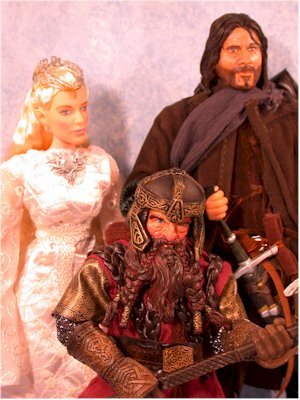 Back in November, I reviewed the first series of 12" Lord of the Rings figures. I gave them ***1/2 stars. What the hell was I thinking? Okay, I still stand by the articulation and quality of the outfits, but the sculpts and rooted hair really did ruin that series. And how do I know this? Did I have an epiphany? No, those are for fools. I just picked up the second series of figures. These are such an improvement, it's amazing. They still aren't perfect, but they show what could have been. Let's hope they haven't already ruined our chances of seeing any more 12" LOTR figures. I picked these up at Wal-mart, where they had them marked at $11.83. I'm betting it was a mistake and I got lucky, but you should check out your local store just in case. "I'm always the ring bearer...argh!" The box art and design are good, although the text could contain greater detail. It's fairly collector friendly, unless you don't like putting back twisty ties. My only complaint with the packaging is on Galadriel. 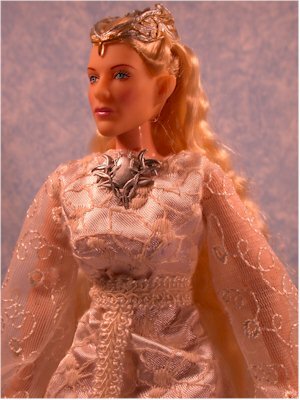 She has that same damn hair 'holder' that Arwen had. It causes some frizzing when you remove it, and it's fairly annoying as well. I don't know what I was smoking when I gave the first series three and a half stars on sculpting. These are so much better, there's no comparison. 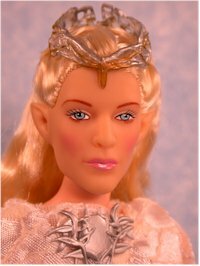 Perhaps Cate Blanchett just translates better into plastic, but her sculpt is much better than Arwen's. And Aragorn's and Gimli's are ten times better than either Frodo or Gandalf. Aragorn isn't quite perfect though. His nose is a tad large and sharp, but that's really the only fault. The sculpted hair is such an improvement that it's really quite surprising. 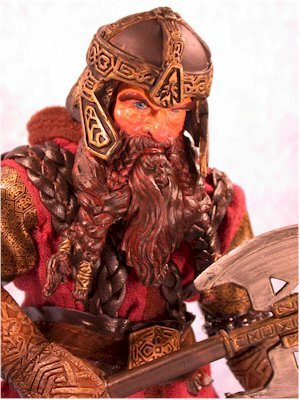 Gimli's sculpt is dead on, and the sculpted hair, including the pony tail down the back, looks excellent. If we had gotten a Gandalf this same way, he would have flown off the shelf. If there's one complaint on the sculpting, it's related to scale. Using the smaller FC body means that Gimli is shorter than I think is really right. He's the same height as Frodo, although he appears heavier. Another inch or so to his height would have made him look better with the other 12" figures. Here's a score that some may not agree with, particularly on Aragorn. There's just the basic paint ops on Galadriel, including a little too much blush. The eyes are neatly done though, and she's very attractive. 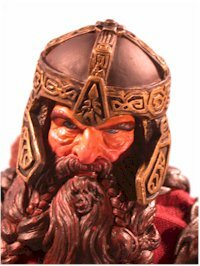 Gimli and Aragorn have excellent paint work on the faces and hair, including a wash that makes them look dirty and haggard. Some may find it too much, but I think it adds a touch of realism that really works, particularly for Gimli. 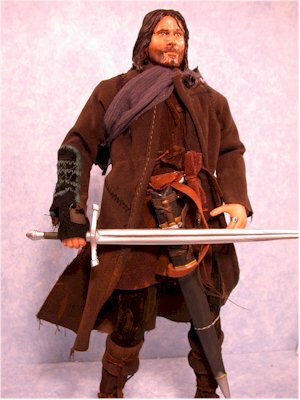 Aragorn's beard may be a bit much for some as well, since it's quite dark and covers a fair amount of his face. But while it's not quite perfect, it's fairly good considering the first series. Here's where I stand by my original review. These three are on the exact same bodies as the first three, although it's much harder to tell. I'm actually guessing at this for Gimli and Aragorn, since removing the clothes is quite a trick for both. 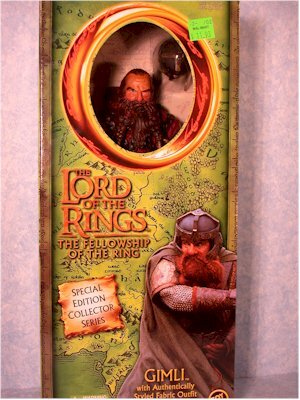 But it appears that Aragorn has the same body as Gandalf, and Gimli has the FC body. It doesn't look like an FC though, due to the excellent design of the clothes and boots. Galadriel is on the same body as Arwen, and it works well for her. Galadriel's outfit is the weakest of the bunch, although it's still fairly nice. The detail work is quite good, and it's very true to the movie. But the stupid slippers that Arwen was cursed with are back, and you'll have to keep them rubber banded to her feet. The material also seems a bit thin, and some of the material in the sleeves needed to be stitched a little better. 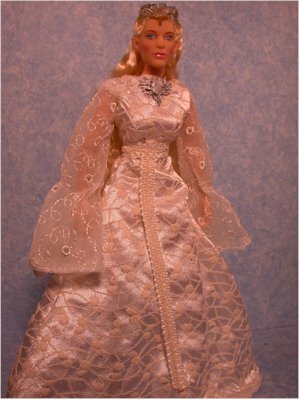 The plastic brooch looks plastic, cheapening the beautiful dress. Aragorn is nice, but had one glaring flaw. The body suit fits well and looks like crushed velvet. The vest fits tightly, and the coat looks good - until you look at the lower back. The bottom edge had a lot of fraying and loose threads already, and needed hemming to avoid this problem. His belt is also fairly weak, and the boots are just plain silly. 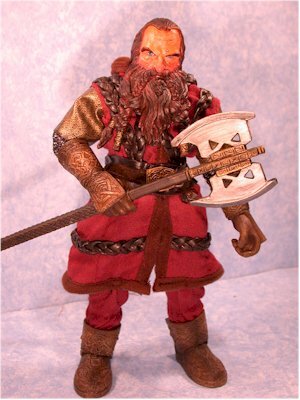 He needs hard plastic boots, similar to Gimli. Gimli's outfit is perfect. From the great boot sculpt, to the heavy leather braided straps, and the well designed overcoat and body suit that make him appear stockier than his body really is, he's the perfect example of how good the sixth scale figures could be if Toybiz tried hard enough. I particularly like the faux mail on his arms, which looks great even though you can only see a small bit at the mid arms. His helmet also deserves special mention, with great sculpting, and a perfect fit. This is a category that these fall a bit short on. Galadriel has nothing, and there are possibilities they could have given her. 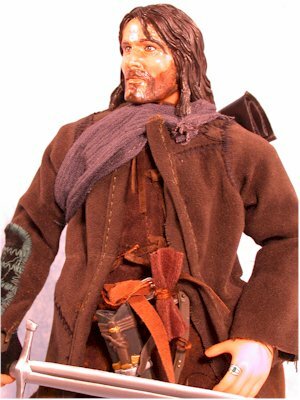 Aragorn has a couple that I didn't count as part of his outfit - a bedroll around his back (although it doesn't look like he'd be too comfy on it), the sheath for the sword, and of course the sword itself. The sheath is nicely detailed, but the sword is truly pathetic. The plastic is extremely soft, and you should be very careful that you don't break it just trying to straighten it out. Gimli has one accessory, his battle axe. Unlike Aragorn's sword, the axe is well made and well sculpted. It fits in his hands, and looks great with him. I'm going to assume that I got lucky when I picked these up for twelve bucks each. At that price, they're all four star values. But at the probably price of $18 or so, the value drops off, particularly for Galadriel. With no accessories, and a less complicated outfit, she's certainly not worth that much. 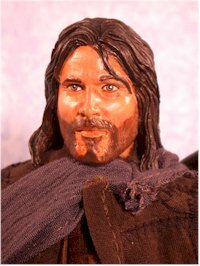 I feel bad giving Aragorn a worse score than the first series, as he really is a better figure than any of those three. But compared with Gimli, he just can't quite do as well. If the sword was just slightly better, and he didn't have a hundred loose threads hanging off the lower edge of his jacket, he would have gotten another half star. Galadriel is hurt by her complete lack of accessories, and those stupid slippers. Her sculpting is decent, but she's just not up to the level of the other two. What can I say about Gimli - he's fantastic. If all six of these figures could have been like him, this line would have sold like hot cakes. Assuming that hot cakes sell well. That's what I've heard anyway. - Amazon.com also has them, but they aren't showing up as in stock yet. They have tomorrow, July 20th, as the release date. They are $23 each plus shipping. (MROTW Affiliate). If you check some of the coupon sites you should be able to save some cash here as well.